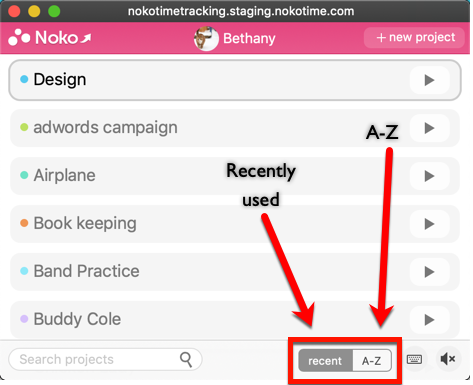 To make time tracking even easier, Noko comes with a variety of preference settings that you can configure to fit your way of tracking time better. All these settings have defaults that are chosen for what works for most people—but everyone is different, so you might want to tweak these! Noko automatically remembers this setting, there's no need to save it or do it every time you log time. Just like with tags in the quick entry box, you can also configure a custom order for projects in your Timer. You can sort either by your most recently used projects, or alphabetically. Just click the sort order toggle on the bottom of the Timer to choose an order. Noko automatically remembers this setting, there's no need to save it or do it every time you use the Timer. Noko, by default, sends you a weekly report about what you've tracked the week before. You can opt out of weekly reports in your settings—see Receiving weekly email reports. Open up your personal settings by hovering over your avatar and name and clicking Settings & Profile. Select the Date, Time & Formats tab. Choose your week start day. If you're in the US, that's Sunday, practically everywhere else it's Monday. This will change your Mini-Pulse, the Pulse page, the date picker, the way report tabs ("this week" etc.) select dates, and time grouping options for reports. Selecting "Monday" will also show week numbers in the date picker, as these are used in Europe. Choose your preferred time formatting. Fractional hours are quicker to read and produce less clutter. If you're not using billing increments, the hours:minutes formatting could work better for you as it always shows minutes as whole numbers. Note that if you have chosen fractional hours, minutes that can't be represented by a fraction are also formatted as hh:mm; Noko will always show you the exact time you've logged. Select your paper format for PDF downloads. In the US, unsurprisingly, that's US Letter; if you live in a part of the world that doesn't use body parts for measuring lengths anymore (aka you use the metric system) you'll want to pick A4. When you're happy with your settings, click Save Preferences & Close. All these preferences only affect you personally. Other people in the same Noko account can choose their own preferences.